FALLS CHURCH, Va. – June 5, 2018 – Northrop Grumman Corporation (NYSE: NOC) announced today that the U.S. Federal Trade Commission (FTC) has cleared Northrop Grumman’s proposed acquisition of Orbital ATK Inc. The FTC’s Bureau of Competition has completed its review of the merger, and the Premerger Notification Office has informed the company that the waiting period under the HSR Act has terminated, allowing the companies to complete the merger. As part of that clearance, the FTC issued a decision and order providing for solid rocket motors to be available on a non-discriminatory basis under specified circumstances and under processes defined in the order. The company expects to complete the transaction after market close tomorrow and is issuing the following updated guidance. This updated guidance assumes the completion of the transaction tomorrow. 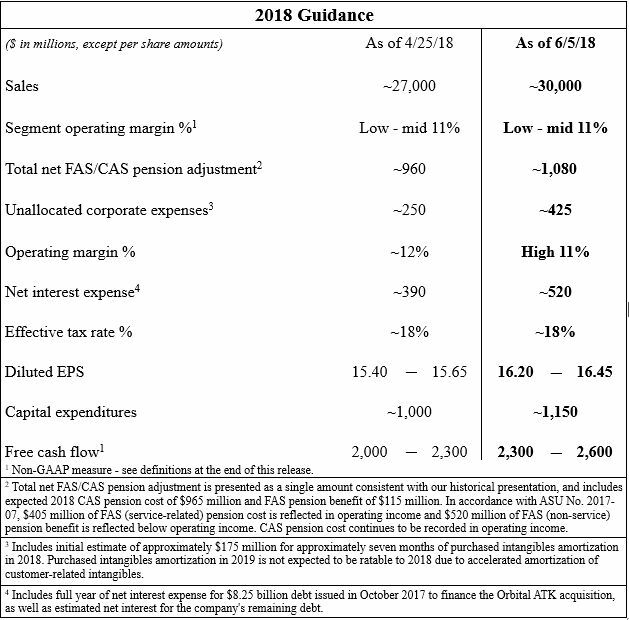 1 Non-GAAP measure - see definitions at the end of this release. 2018 financial guidance reflects the company's judgment based on the information available to the company at the time of this release. The government budget and appropriations processes can impact our customers, programs and financial results. Government budgets, appropriations, including the timing of appropriations, and the occurrence of continuing resolutions and government shutdowns can impact the company's ability to achieve 2018 guidance.